Owens-Illinois had sunk millions into manufacturing plasma displays when it gave up on the business and sold its plasma division in the 1970s. U.S. TV companies didn't last long after they came to understand the investment it would take to make plasma competitive with cathode ray tubes. Computer companies stuck it out until 1987, when IBM became the last major U.S. company to dump its commercial plasma display business. That left only the Pentagon to sustain a small but very lucrative plasma display industry in the U.S.
Weber had derived most of his income from consulting on the commercial side, so there wasn't a lot left to do when IBM closed its plasma manufacturing plant in Kingston, NY. Except perhaps to join forces with three former IBM executives, buy the used equipment from the plant (88 trailer truckloads of it), haul it to an old apple juice factory in nearby Highland, and hang up a shingle. Which is exactly what he did. 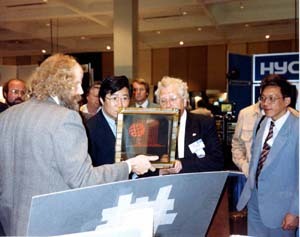 In 1990, Weber moved to New York and assumed full-time duties at the new company, which scraped by producing monochrome plasma computer displays until 1993. But by that time, liquid crystal displays had achieved color and conquered the market. Plasmaco now faced foreclosure, and the company's investors shook up the top management, making Weber president and CEO and forcing him to fire half his staff. "Things got very ugly with all the creditors that were after us," recalled Weber. "The sheriff was knocking at my door because we couldn't even show up for court. The lawyers wouldn't represent us because we hadn't paid them." 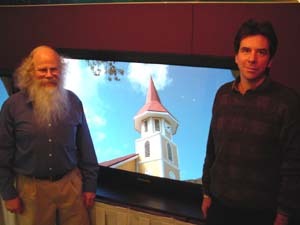 Weber convinced a banker to lend him $80,000 for components to begin developing a color display. By the last day of a 1994 industry convention in San Jose, CA, he was able to rig a static display of colored stripes that impressed people with its brightness and contrast ratio. Weber then began a joint development program with Matsushita, which bought Plasmaco in 1996 for $26 million, leaving Weber in his position as president. Weber hired his old student Bill Schindler (MSEE '82) to manage Plasmaco's 60-inch prototype project, unveiled in 1999 and widely agreed to have the best contrast ratio in the industry.